The bright white moon hangs in a vivid blue sky and peers through a series of rock formations in Joshua Tree National Park, California, USA. Smooth rocks which appear to lean against each other and hold a series of smaller rock formations on top, frame the vivid white moon. This rock, which had its beginnings as liquid molten, cooled near the earths surface then was gradually exposed through many years of erosion to reveal the smooth jointed rocks we see today. These rock formations are prevalent in the Skull Rock Loop Trail in Joshua Tree National Park. It is great when nature co-operates with beautiful blue sky, a vivid white moon, and golden colours on the rock formations. Joshua Tree National Park is a photographers wonderland with many stunning scenes to photograph. 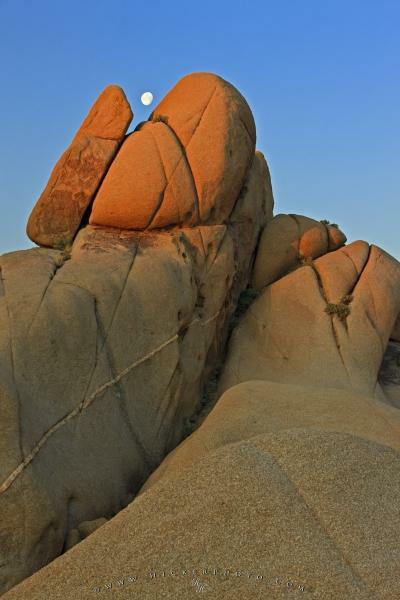 Photo of the moon above rock formations in Joshua Tree National Park in California, USA. Pictures from photo gallery "Joshua Tree National Park Pictures"
This picture is part of the photo album "Joshua Tree National Park Pictures" - there are more beautiful images waiting for you.